NEW YORK--(BUSINESS WIRE)--Consumers and small businesses in communities across the U.S. and Puerto Rico are preparing to celebrate Small Business Saturday, taking place this year on November 24. Because an average two-thirds of every dollar ($0.67) spent at small businesses in the U.S. stays in the local community, consumers’ local impact during the important holiday shopping season could be significant. 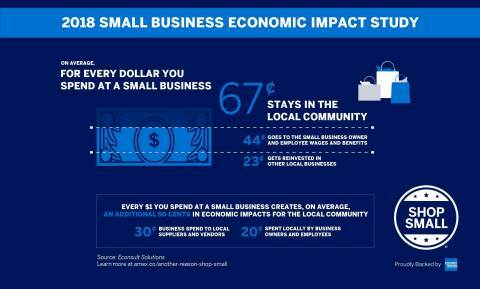 Further, every dollar spent at small businesses creates an additional 50 cents in local business activity as a result of employee spending and businesses purchasing local goods and services, according to the Small Business Economic Impact Study from American Express (NYSE: AXP). American Express created Small Business Saturday in 2010 as a way to help small businesses get more customers, and the celebration has since become an annual shopping tradition on the Saturday following Thanksgiving. The Small Business Economic Impact Study, a county-level economic analysis on shopping small commissioned by American Express, provides a closer look at the economic benefits of shopping locally and the impact of small business on communities. The study found that if small businesses in the U.S., defined as businesses employing fewer than 100 employees, were a country, they would have a GDP of $4.8 trillion, equivalent to the GDP of Japan, the third largest economy in the world. The study also demonstrated the extent to which small businesses support jobs locally. In addition to small businesses directly employing members of the community, spending by those small businesses and their employees in the area also supports local jobs. In fact, for every ten jobs at a small business, another seven are supported in the local community. Now in its ninth year, 97% of consumers who plan to Shop Small on the day said Small Business Saturday has had a positive impact on their community, according to the 2018 Small Business Saturday Consumer Insights Survey, another study released today by the National Federation of Independent Businesses (NFIB) and American Express, based on a separate survey of consumers. The survey found that nine in ten (91%) consumers believe it is more important than ever to support small businesses this holiday season, and 83% plan to do at least some portion of their holiday shopping at a small, independently owned retailer or restaurant - either in person or online. On par with previous years’ celebrations, nearly six in ten (58%) U.S. consumers reported being aware of Small Business Saturday, and among those, 80% plan to go out and Shop Small at independently-owned retailers or restaurants on the day. Plans to shop include visiting independently-owned bakeries (40%); clothing, accessory and shoe stores (40%); restaurants, bars and pubs (37%); bookstores (32%); and gift, novelty and souvenir stores (30%). Every year, small businesses, local Chambers of Commerce, business associations and other community organizers join together as Neighborhood Champions to bring their neighbors out to shop on the day. In 2018, more than 7,500 Neighborhood Champions have committed to plan activities and events to get shoppers in the doors of small businesses on Small Business Saturday. Discover Neighborhood Champions online here. Small business owners can create customizable Small Business Saturday marketing materials and find additional inspiration for events to rally their communities at ShopSmall.com. In addition to Neighborhood Champions, the Small Business Saturday Coalition coordinates activities with public officials, small business owners and consumers on the day. Women Impacting Public Policy (WIPP) has led the Small Business Saturday Coalition since it launched in 2011, and it has grown to include national, state and local associations across the country and in U.S. territories. American Express has also enlisted the support of many companies that are serving as Corporate Supporters to help drive excitement for Small Business Saturday. Together these companies reach millions of small businesses and consumers. The 2018 Corporate Supporters include FedEx, Etsy, Intuit, Microsoft and Square. Everyone is welcome to join the Shop Small community online by using the hashtags #ShopSmall and #SmallBizSat between now and Small Business Saturday. Consumers can also RSVP on the Small Business Saturday Facebook page and receive reminders to Shop Small this November 24th, and show your support using our brand new stickers and GIFs by searching ‘Shop Small’ on Giphy via Facebook, Instagram, and Snapchat stories. The 2018 Small Business Saturday Consumer Insights Survey was conducted by Teneo on behalf of American Express and the National Federation of Independent Businesses (NFIB). The survey is a nationally representative sample of 1,995 males and females 18 years of age or older. The sample was collected using an email invitation and an anonymous online survey from October 15-26, 2018. The survey has an overall margin of error of +/- 2.2%, at the 95% level of confidence. The 2018 Small Business Economic Impact Study was conducted by Econsult Solutions, Inc. (ESI) on behalf of American Express. ESI calculated the share of national Gross Domestic Product (GDP), employment and employee compensation that small businesses with under 100 employees provide to the economy based on an analysis used by the U.S. Small Business Administration. ESI also estimated how much of each dollar spent at the average small business remains in their local community, and used input-output analysis across 100 representative U.S. counties to calculate the additional impact that is generated locally as the result of the spending of employees and the spending of the small business with local suppliers and service providers. November 24th is the ninth annual Small Business Saturday, proudly backed by American Express. Dedicated to supporting the diverse range of local businesses that create jobs, boost the economy, and enhance neighborhoods around the country, Small Business Saturday was created by American Express in 2010 in response to small business owners’ most pressing need: getting more customers. Learn more at and connect with us on ShopSmall.com, instagram.com/shopsmall, facebook.com/SmallBusinessSaturday.